When they are working well, automatic garage doors are the best thing since sliced bread. When they start to play up though, it can be more than a little annoying. Even if you perform routine maintenance on your garage door and opener, sooner or later something will wear out or malfunction. Before you get on the phone to a repair specialist though, follow these 5 tips to see if you can resolve the problem yourself. A little DIY is good for the soul and even better for your credit card if it saves the cost of a technician’s call out fee. If your garage door opener doesn’t respond at all when you press the open or close buttons, it could be a problem with the electricity supply. Inspect the power outlet which supplies the door opener to make sure the wiring is OK and that the plug hasn’t come loose. If the outlet appears fine and you can establish that there is definitely no power, it’s probably time to call on that technician, or an electrician. If the problem doesn’t appear to be anything to do with the electrical supply, follow the next tip. 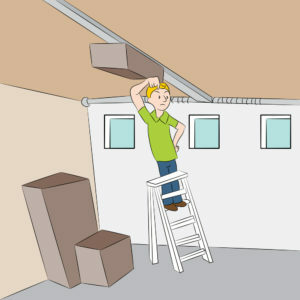 Try operating the garage door’s manual override by pulling on the manual release rope or chain. This should enable you to open the door manually. If this doesn’t work and the door appears to be stuck, move on to the next tip. Inspect the tracks in which the door rollers run for any obstructions. Small pebbles, hard-packed dirt and other debris can seriously affect the operation of an automatic garage door. It only takes a small obstruction in the tracks to cause a door to stick fast. Clear out any obstructions you find and test the door. If it still isn’t working correctly, proceed to tip 4. To be sure that the door itself hasn’t sustained any damage, give it a visual once over. The door may have been hit by something which went unreported. If you do discover any significant damage to the door, you will probably need a professional repair. If you find no damage, check the next tip. It’s always possible that the motor for your garage door opener has overheated. Carefully check the motor housing with your hand. If it feels very hot, leave the door alone for a while and let the motor cool. Then try the door opener again. If this alleviates the problem, you will probably be looking at a new motor very soon. An overheating motor typically means it’s reaching the end of its serviceable life. If the door still won’t respond after the motor has had time to cool, contact a garage door technician to perform further investigations. These are just a few things you can investigate to troubleshoot a malfunctioning door. It’s far from being an exhaustive list. However these tips do cover the most likely problems with your door and opener. If after following them, you still haven’t identified the issue, it’s probably worth calling a garage door repair company to come and cast a professional eye on your door apparatus. To keep the biggest door in your home operating smoothly and safely, give it a monthly inspection. You can save unplanned garage door repairs by employing a simple monthly set of checks. If you don’t wish to perform the inspection yourself, many companies that repair garagedoors offer inspection and service plans. However, this can prove expensive and the attention required to keep your door in tip-top shape is within the capabilities of pretty much any healthy person. 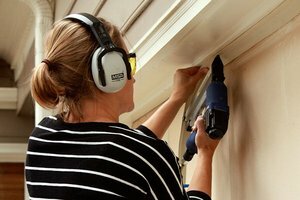 If you feel ready to tackle some basic inspection tasks on your garage door, here are four tips to help you begin your own monthly program. Just to be on the safe side, inform everyone in your home before you carry out maintenance and tell them not to try and open or close the door until you’ve finished working on it. The first thing to do is perform a quick visual check of the door. This should be done from inside your garage with the door closed. Check the door cables for any fraying or wear. Test all the mounting hardware by hand to see make sure no screws or bolts have loosened. Perform a visual examination of the pulleys, door rollers and springs. If you find something which doesn’t look or feel right, make contact with a garage door technician to have a professional inspection performed. A door which is out of balance will put unnecessary strain on your automatic door opener, if you have one. To check the balance, disconnect the door opener with the door closed. Now open the door by lifting it manually. It should open smoothly without resistance and should remain fully open when you let go of it. If the door doesn’t remain open or feels hard to lift, it’s probably out of balance and you will need a technician to carry out a service. Garage door openers manufactured from January 1993 onwards are required by law to have a reversing mechanism, triggered by sensors. This safety mechanism is to prevent the door from descending on anyone and injuring them. To test the reversing mechanism, place a piece of wood or similar object in the center of the door opening where the door would meet the floor on closing. Next, use your remote control to close the door. As soon as the door makes contact with the wood it should reverse direction. If the door does not immediately reverse, have a professional take a look and perform remedial action. As well as reversing when it makes contact with something, it should also reverse direction when the sensors detect something in its path. To test the sensors, press the button on your remote to close the garage door and, while the door is descending, wave a broomstick or similar item in front of the sensors. The door should immediately reverse direction. If not, have a professional repair carried out. Performing the four simple checks above will save you from any dangerous incidents or emergency callouts to fix a broken door. If you are really handy you can carry out some basic repair tasks if you spot issues with your garage door. If not, a local installation and repair service will be happy to come and fix any problems that you identify. Most people who enjoy the benefit of an automatic garage door opener agree that in terms of convenience, it’s an extremely worthwhile investment. Opening your garage door with a press of a button is a whole lot easier than manually lifting it up and down. That said; the only time you might find yourself cursing your automatic garage door is when the power’s out. Fortunately we enjoy a stable supply of electricity in the USA, but even so, power outages do occur. If you do suffer a power cut, you could well find that your car is in the garage and you need to get out, or vice versa. Therefore, although power outages are rare events, it’s a good idea to become familiar with the manual operation of your automatic garage door. The first thing you will need to do, assuming you have access to the inside of your garage when the power goes out, is find the bypass control. Very often this is a handle on the end of a rope, usually colored red. Pulling down on this handle will put the garage door opener into manual mode. If ever you are in a situation where power may be off for a while, or if there is a problem with the motor of your door opener, you will probably need to keep the door in manual mode. When in manual mode, you will have to open your garage door by physically lifting and lowering it. To make sure the bypass rope doesn’t end up caught in the tracks, pull the rope down around the back of the door opener motor. 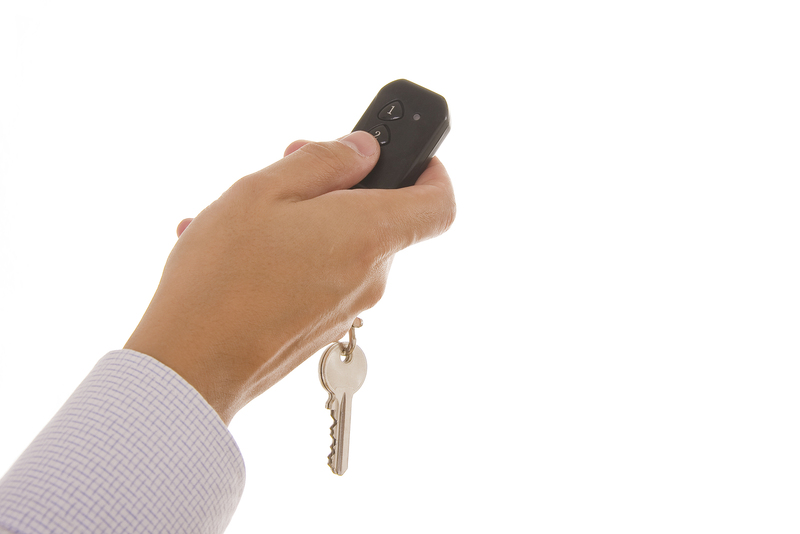 Once the power is restored to your home, you will need to switch the garage door opener back into its automatic mode. There are two ways in which you can do this. The first way is to use the rope. Pull down hard on the rope and make sure you see the mechanism lock back into place. Another way to reengage the mechanism is simply to activate the door using the button on your remote control. The track should then force the spring attachment to lock back into place. If you are unfortunate enough to be locked out of your garage when the power goes out and you don’t have any keys to the rest of your house doors, you may be able to release the spring mechanism lever from outside. You’ll need to try and slide something like a bent clothes hanger through the gap near the top of your garage door. You may have to use something as a shim as well if you have weather stripping on the door. Use the clothes hanger to try and flip the lever from outside. 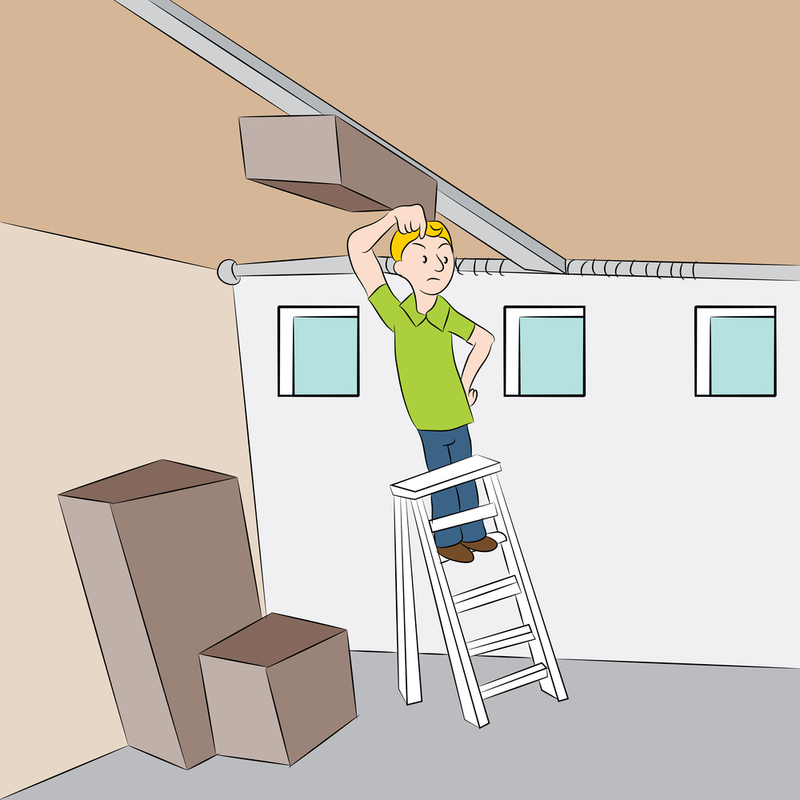 As a final note of warning – If a power outage occurs while your garage door is up, you should prop the door with a couple of 2x4s to stop it from crashing down when you pull the rope and engage manual mode. Hopefully you won’t often have to deal with power cuts of more than a very short duration. Just in case you do though, it’s a good idea to go locate that bypass rope, so you can find it easily in the event of an outage. Is Your Garage Door Hurricane Proof? If you live in a region exposed to hurricanes or very heavy coastal storms and you’ve been there a while, you may already know the following fact, but just in case you don’t, here it is. Your garage door seals the largest opening in your home: if it fails to hold back a hurricane, the resulting change in air pressure can blow the roof off your home or cause other serious structural damage. There are not many situations in which you would be recommended to replace or upgrade an undamaged garage door, but if you live in a hurricane prone area, this is one of the few. Quite simply, you have two options to get your garage door hurricane proofed. One option is to replace your existing door with one which is hurricane proof. The other is to install an add-on kit which can be used to provide extra bracing in the event of a storm. Whichever option you choose, you should purchase a product which is rated to meet the wind load requirements of your locality. For example, in Miami-Dade County, Florida, Garage doors or add-ons should be able to withstand wind speeds of 150 MPH. In other counties the requirement may be a little more relaxed. Once you know the wind speed that your garage door should be able to withstand, you can either purchase a specially designed hurricane proof door and have it installed, or get an appropriately rated add-on solution. An add-on system uses braces which must be preinstalled. The braces have mounts on the garage floor and install vertically from these, through the header above the garage door. Often, the braces are also fixed through the actual garage door hinges as well. Once the mountings are installed, you need to physically fit the braces when you know a storm is on the way. Obviously you can’t use your garage door once you attach the braces, but during the storm they will prevent the door from getting blown inward. Braces which are fixed through the hinges also protect the door from being sucked out by negative internal pressure. After the storm or hurricane has passed, the braces can be removed again and the door operated normally. Passive systems need no action in advance of a storm other than locking your garage door. The drawback is that they include a specially reinforced garage door. In other words you need to replace your existing door with a new, reinforced one. A hurricane proof door such as this has internal bracing which is activated when you lock the door itself. These systems also include reinforced door tracks and the best ones include some additional braces which you can attach on the approach of a storm. While all this may sound rather drastic, the power of hurricanes should not be underestimated. If you have a large, double garage in particular, the stresses places on the door during a storm are immense. A storm proof replacement door or active bracing kit is an investment which will potentially save your home from thousands of dollars in repairs. Any money spent on preventing this is surely an investment and may well be a requirement of your home insurers. Your garage door represents a large part of your home’s frontage. In most cases, the garage is visible to anyone walking or driving past your home. Perhaps more importantly though, your garage door is the first thing you see when you pull your car onto the drive, or even when you enter your home on foot. A clean, new looking garage door will add to the feel good factor when you come home from a busy day at work or from a few days away. 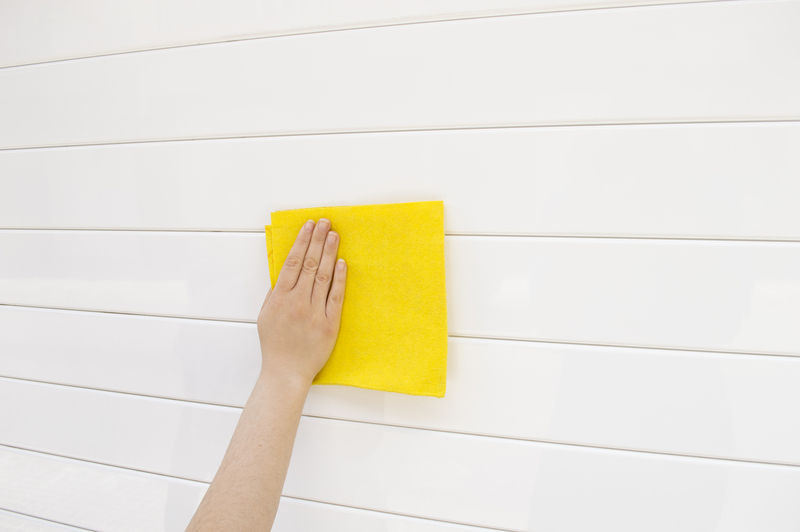 1) Grab yourself a hose, a bucket, some gentle detergent and a scrubbing brush or cloth. 2) Wet the entire outer surface of your garage door using the hose. 3) After filling the bucket with some warm water and detergent, use this solution with your rag or scrubbing brush to gently scrub the door down. If your door is marked with oil stains, or something more stubborn than regular dirt, use a diluted solution of bleach to scrub it with, rather than detergent. 4) Spray the garage door down with your hose to rinse it off. 5) If your door is constructed from metal, apply a coat of wax polish to restore its luster. 6) Repeat steps 1 through 5 on the inside surface of your garage door. While the inside is not so visible, keeping it clean is important to keep dirt from getting into the door tracks and mechanism. 7) Now, use a broom to remove any dirt and dust from the tracks that your garage door runs on. For any clods of mud or harder to remove dirt, use water and a rag to get inside the track and really clean it out. Keeping the tracks clean is important to prevent your door from getting derailed or jammed in the future. 8) Now that the tracks are clean, lubricate them along with the wheels on your door, according to the manufacturer’s recommendations. 9) Finally, organize and clean up the area around the garage door. If possible, keep this area clear of anything that could fall and obstruct the opening and closing of the door. That’s really all there is to it. If your garage door is painted, once clean you will be able to see any damaged or flaking paintwork or areas where bare metal is showing. To avoid corrosion problems, it’s a good idea to sand these areas down and give them a fresh coat of paint. By giving your garage door an occasional cleaning, following the nine steps above, you can keep it looking like new. It’s also the perfect opportunity to check for any maintenance tasks that need completing on your garage door or its mechanism.